I'm super pleased to announce some new work I've got online. I had the idea at the end of last year of shooting a new series of images to show I could create high production value work. Wanting to tie in with the theme of travel, I envisaged a 1930s travel shoot set in London and Istanbul. The story revolves around Clara Hayward, a young woman who is bored with her life in London and embarks on an adventure around the world, first stop the Orient Express! I wanted to evoke the feeling of the golden age of travel, and create a set of cinematic, atmospheric images. The whole series was shot over 3 days, in a beautiful house in London, at Loughborough station and in Fitzroy Square in London. You can see the whole series of 6 images in high-res under the Projects section of the website here. I've also created a whole micro site showing how the images were put together so if you want to learn about the production from start to finish then go here. 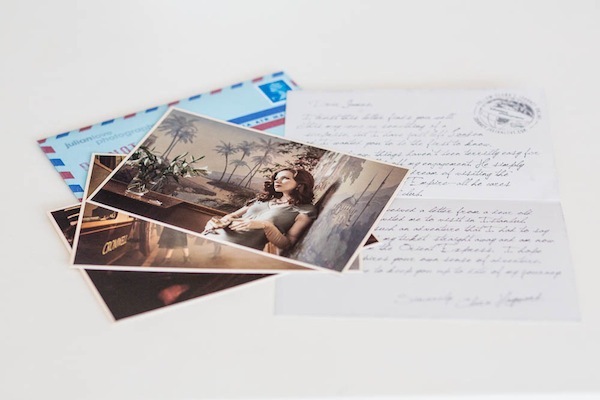 The whole thing has been packaged up into a mailer with hand made airmail envelopes and mailed out to 200 contacts around London, and a custom designed email sent out to a wider audience. I'm really pleased with how the whole thing turned out. Big thanks to the whole team who worked so hard to make all of this happen: Alexa Montgomery for locations and production, Kajsa Soderlund for props and styling, Emma Slater and Carolina Svensson for hair and makeup, Katie Higson, Tom Fewell and Claire Pepper for assisting, Marcus Harris for retouching, Peter Clark for designing the blog and mailer, and of course Emma Rice for being the perfect Clara. Excellent work Julian, hope it results in interesting commissions. Thanks Jon - let's hope so!